J.A. Brennan is part of a consultant team working with the City of Kent and the U.S. Army Corps of Engineers to create a habitat enhancement channel on the Green River at Riverview Park. In this photo, the 25’-deep side channel excavation is nearly complete. 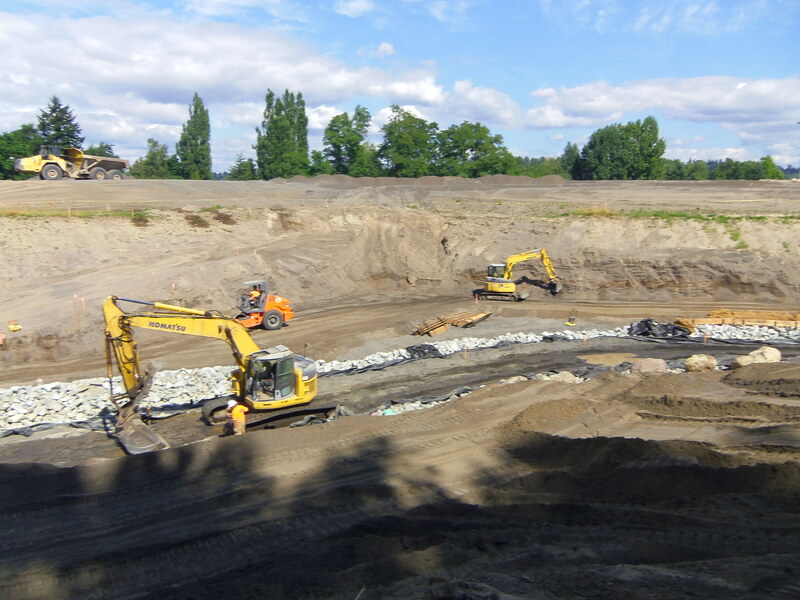 The contractor, Performance Systems, Inc., is busily working to complete the excavation and shore protection. Excavators, rollers and dump trucks criss-cross the site moving and grading soil and fill materials. 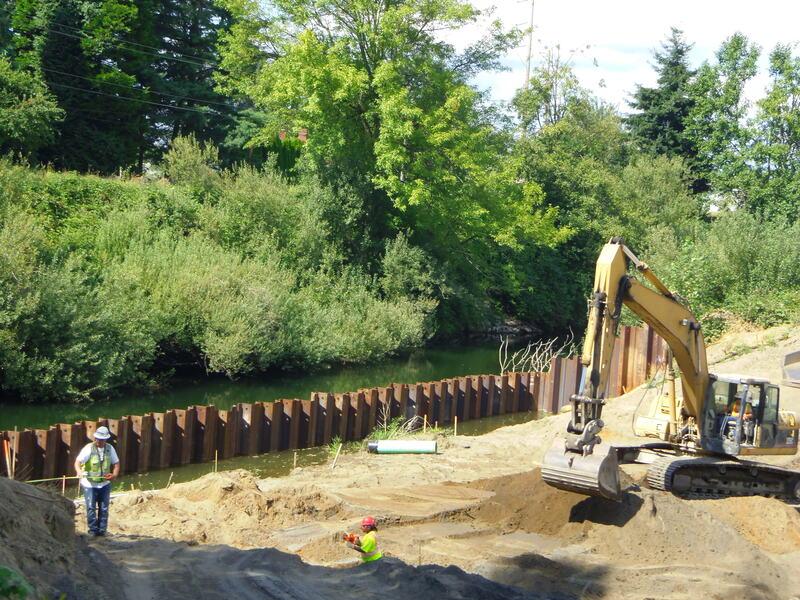 Looking up-channel, a crane installs coffer dam piles. 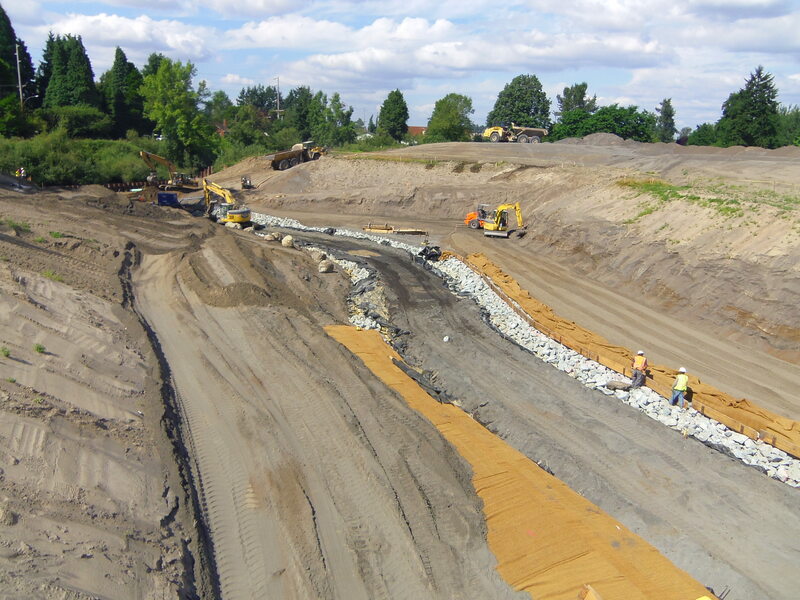 In the foreground, soil lifts – soil wrapped in geotextile fabric – are installed. The lifts will be planted with both container plants and live stakes. 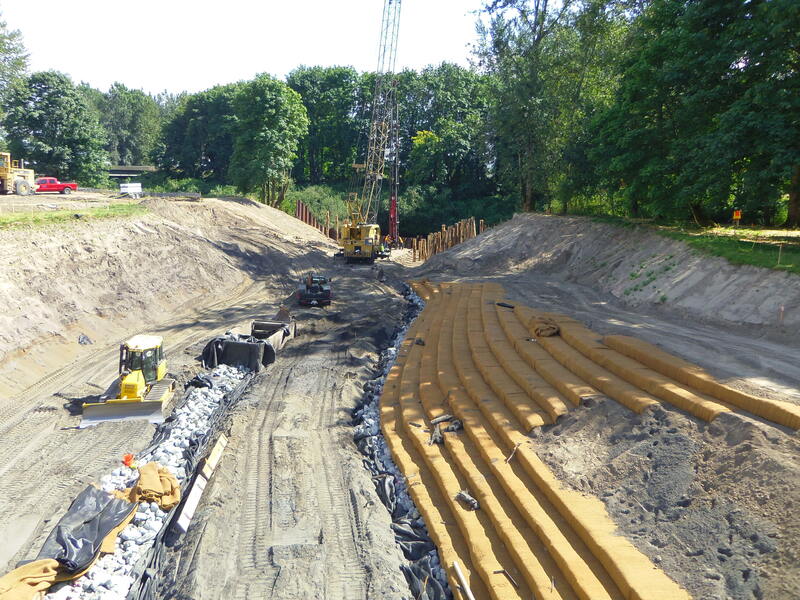 Tetra Tech, Inc., the prime consultant and project engineer, is providing a variety of bio-engineering solutions to create a naturalistic and protected channel bank. 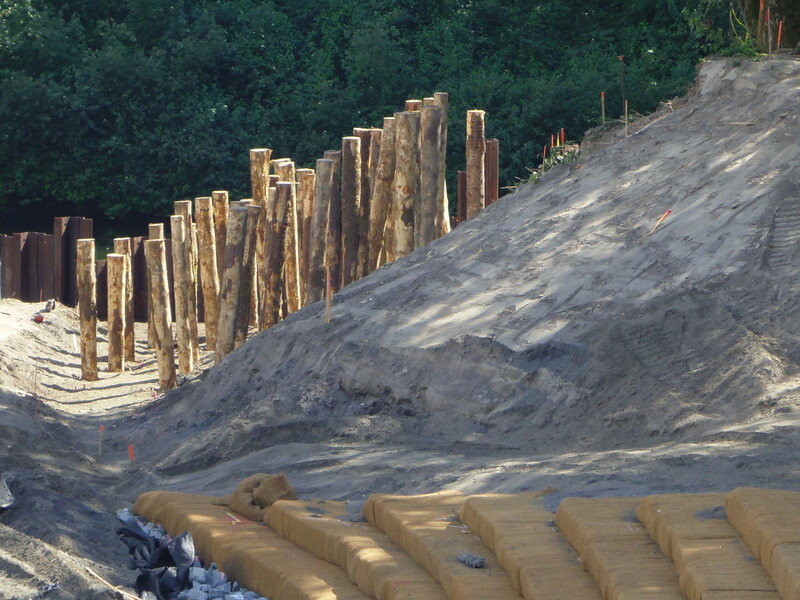 The foundation of the channel inlet constructed log jam structure is in place. This sturdy bio-engineering solution by Tetra Tech, Inc. is the first line of defense against potentially high-velocity, high-volume storm flows surging down the Green River. Live stake plants will provide further erosion control, and help naturalize the constructed log jam. 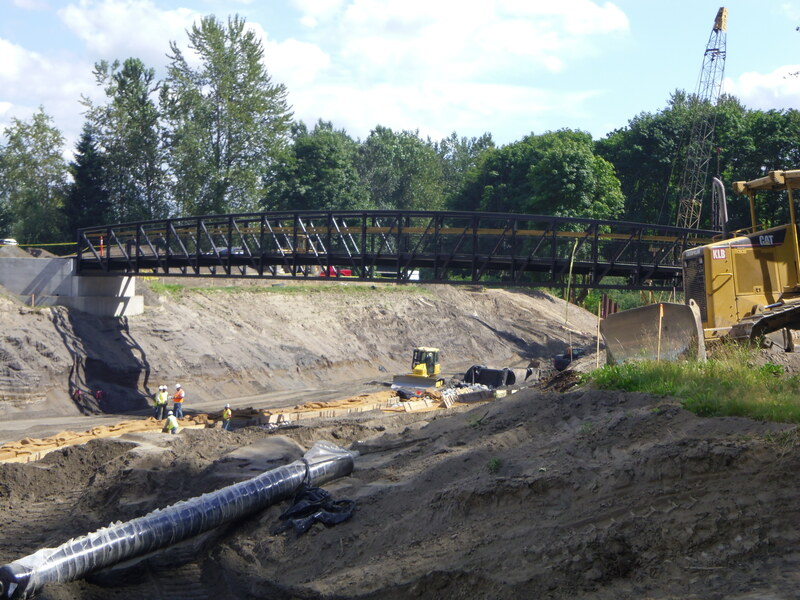 The approximately 125’ long pedestrian bridge is in place. Riverview Park visitors will gain an exceptional view of the new side channel, and access to the island (on the right) between the channel and the Green River. A loop path around the island will meander through meadow and a mature Cottonwood canopy. 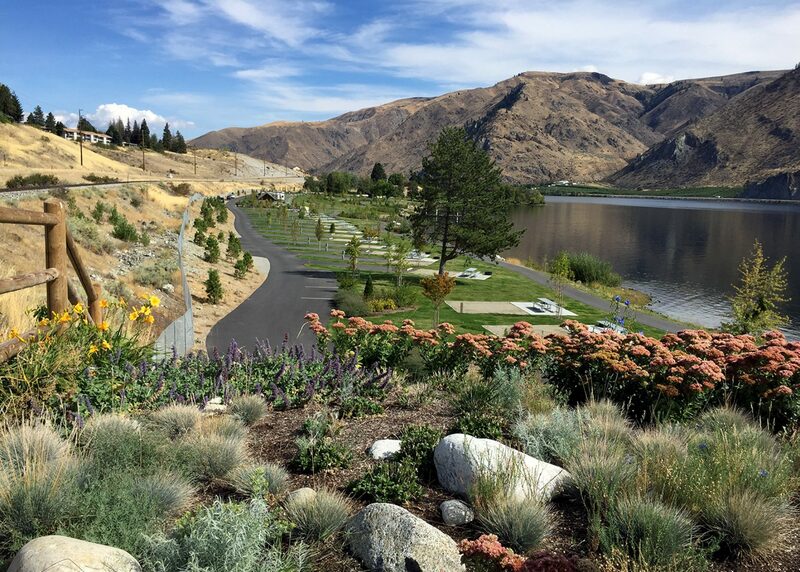 Native plant restoration along the Green River banks will enhance the existing native riparian corridor. Looking at the channel outlet, you can see the coffer dam. An excavator-operator continues to dig out this area to reach channel bottom grades. PSI continuously dewaters the area behind the coffer dam to keep working conditions nice and dry. For more information see the Seattle District US Army Corps of Engineers’ webpage. 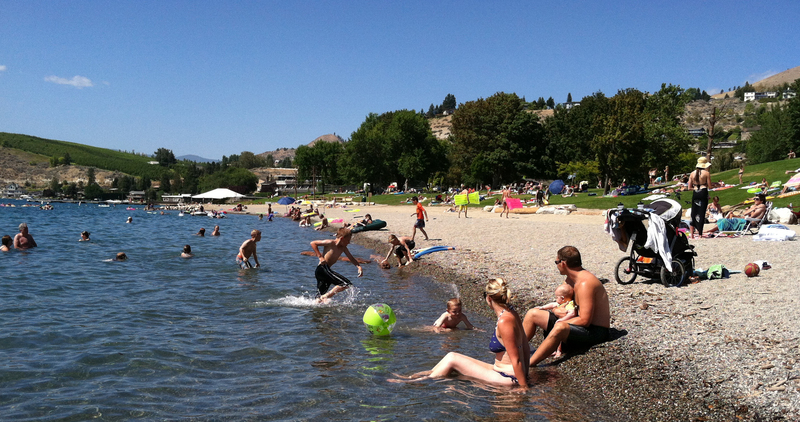 Park use is up substantially and visitors are having a great experience now that the bulkhead has been buried and the park has a beach designed by the J.A. Brennan Associates team. Next spring native aspen trees and other vegetation will be added to create shade, beautify the site, and enhance the riparian habitat.